This is, by far, my favorite cookie from Martha Stewart's Cookies book. I love this vanilla-bean cookie. To be honest with you, I wouldn't even bother with making the buttercream filling. This cookie is spectacular enough to stand on its own. However, I feel like sandwich cookies are for special occasions and sometimes you need to have such a cookie. The original version of this cookie calls for the filling to consist of pureed raspberries, sugar, heavy cream and white chocolate. For the life of me I could NOT get the white chocolate and heavy cream to mix together. I tried three times! The melted white chocolate would seize up when I added the heavy cream, which I figured it would. So, I just decided to stick with a tried and true buttercream. I made an easy raspberry buttercream before so I knew that it would work out perfectly. If you've made the original version of this cookie, please let me know. I'd love to hear if it worked for you. Put flour, baking soda, and salt in a medium sized mixing bowl and whisk together until combined. In the bowl of an electric mixer fitted with a paddle attachment, cream the butter and sugar together and then mix for about 2 minutes on medium high. Add the egg, vanilla extract and the vanilla seeds. Mix until smooth and then reduce speed to low; gradually mix in the flour mixture. Using a 1-inch ice cream scoop, drop the cookie dough onto the prepared baking sheets and bake 8-10 minutes, rotating sheets halfway through the baking time. Let the cookies cool on wire racks. In a large mixing bowl, cream the butter and jam together on medium-high speed until combined, around 2 minutes. Gradually add the powdered sugar and mix until smooth. 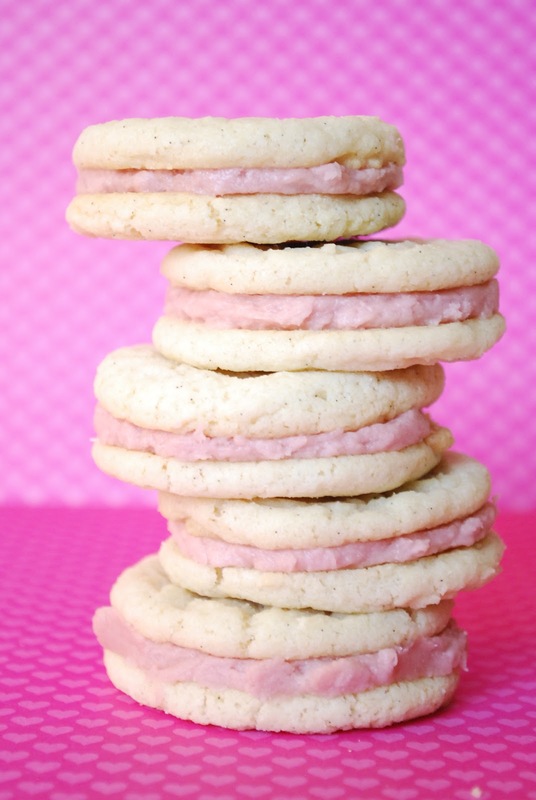 Once blended, spread about 1 T. of buttercream onto the bottom of one cookie and then sandwich with another. The cookies can be refrigerated between layers of parchment in airtight containers at room temp. up to 2 days. You will probably have leftover buttercream. Enjoy at your leisure! I need to try those cookies! I'm drooling looking at the pictures. These do look fabulous! It is great to have a recipe that you can prepare two ways. A stand alone vanilla bean cookie does sound delicious. Even though the published filling recipe did not work, you made a great choice with the butter cream. While chocolate is not easy to work with, I have had my problems with it also. These cookies are SO PRETTY, and I'm sure they have a taste to match! Beautiful cookies! I like the raspberry butter cream idea! Oh yum! These are going onto my must make list for sure! I'm not a huge fan of raspberry, so I wonder how another jam (like orange or cherry) would work in your work-around. Hrm. I love the buttercream filling...This is multipurpose too. Thanks for sharing. I just discovered your blog and I'm so glad I did - I'm your newest follower. This is one recipe from Martha Stewart Cookies that I haven't tried. Guess I've been missing out. They look great. This is a recipe I'm going to save and make very soon! The cookies in the picture looks oh so good! Thanks for the recipe! I am wondering how it is possible to print the recipe without the comments. I wasted 8 pieces of paper to print the recipe which was 2 pages. you have to ganache the white chocolate - heat the cream (don't boil, simmer or scorch it,) add the chocolate pieces. let it sit for about 3 minutes. then stir the mixture until it is uniformly smooth. YAY!! I'm so glad to hear that. I have to say, these are my favorite sugar cookies. Honestly, I rarely make the raspberry buttercream part, I just love the cookies!! LOL!